To apply for Split Summer School 2018, please use online registration system (click here). Registrations are open to 15th of July. After payment, every participant will get discount voucher for accommodation in nearby, newly built student dormitory at popular prices due to agreement between dormitory and hosting faculty. Introductory learning materials for all subjects will be distributed before beginning of school, so that students can have head start. Student will be informed timely via forum section and school webpage. Split Summer School holds the rights not to offer courses where final number of applicants is fewer than 10. If that case occurs, applicants will be informed and offered to change their course to alternate one. Since our capacities are limited, admission list is ordered by reception time. Final class schedule will be known after 10th of August. Price of tuition fee is 300 EUR [€] (conversion from other currency according to Croatian National Bank middle exchange rate at payment day). After payment, every participant will get discount voucher for accommodation in nearby, newly built student dormitory at popular prices due to agreement between dormitory and hosting faculty (you can check it here). Accommodation includes room and breakfast. Separate registration is needed for reservation of accommodation, which is done via email to dormitory (more detail in email from coordinators) and are open until 15th of July. Accommodation options are: shared twin room and single room. In case of shared twin room, applicants can choose flat mate (see forum discussion for finding flat mate) or flat mate will be randomly assigned among other students. 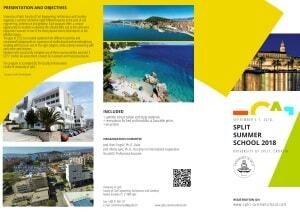 Optionally, students can be accompanied by one other person, who isn't taking any classes at Split Summer School. Accompanying person is paying accommodation expenses. For shared twin room price is 189 EUR [€], and single room is 300 EUR [€] for whole arrangement. For students that need to acquire a Croatian visa, there is a certain administrative process their application needs to go through (for more information click here). Prior to receiving an admission letter and other documents required for Croatian visa, you need to make a full tuition fee payment. All international students are required to have health and travel insurance from their home country prior to their arrival in Croatia. This type of insurance has to be valid in case any health services will need to be used while staying in Croatia. For students coming from the EU countries their EU health insurance card is valid under the stated terms and conditions.